Originally reviewed in School Library Journal, March 2017. Gr. 9 & Up – Yu’s debut, realistic fiction young adult novel is set in upstate New York at Camp Ugunduzi, a wilderness therapy camp for troubled teens. The quickly-paced story is told in alternating points-of-view between five unique campers, just introduced and grouped together during the four week long camp. Clarissa, suffering from OCD, wants to get better and experience some “normal” teen activities. Andrew, whose eating disorder caused the band to break-up, is guilt-ridden and longs to get better. Ben, unable to separate fantasy from reality, prefers to go through life pretending to be in a movie, complete with voice-overs. Cold, unfeeling Stella has been to camp before, and doesn’t want to be back. Mason, narcissistic and full of himself, feels he has no problem, but is merely surrounded by idiots. Thrown together with no social media or daily luxuries, the teens find themselves getting comfortable with each other, despite initial trepidation. Perhaps one thing they all share is annoyance at the counselors: middle-age, hippie Josh and overbearing, prude Jessie. When tragedy strikes midway through camp, the teens’ progress and outlook are tested. The emotionally-charged, yet hopeful ending will encourage understanding and empathy to even the most reluctant readers. Background material is added piecemeal, as characters think back to the situations which brought them to camp. The characters are diverse, balanced well between male and female, and appealing to readers of both genders. The story includes mature language and content (i.e. underage drinking and smoking). At times raw and heartbreaking, the language is realistic, which teens will appreciate. VERDICT – Recommended as a first purchase for teens. Humorous scenes throughout will delight readers, despite the heavy subject matter. Review first appeared in School Library Journal, January 2017. WEBBER, Katherine. The Heartbeats of Wing Jones. 336p. Delacorte Press. Mar. 2017. $17.99. ISBN 9780399555022. Gr 8 Up – Set in 1990’s Atlanta, this coming-of-age story is realistic fiction with a touch of magical realism, is full of diverse and strong female characters. Bullied for her looks, Wing Jones, half Chinese and half black, doesn’t stand out like her football star, golden boy brother, Marcus. After a night of drinking, Marcus causes an accident, killing two people and ending up in a coma. Unable to sleep at night, worrying for Marcus and living on the brink of poverty, Wing starts running. Though Marcus is one of the reasons Wing is running, she is able to step out of his shadow, finally feeling acceptance and accomplishment. Aaron, Marcus’s best friend and Wing’s long-time crush, is also a runner, providing a romantic element and additional distraction for Wing. Running gives her the courage to embrace her differences and stand out. Wing’s family back-story regarding her father is heartbreaking, revealed early on, explaining why her father is not in the picture. Wing lives with her mother and both grandmothers, and as such, is surrounded by female role models with take-charge attitudes. The plot moves along quickly, written in first person through Wing’s perspective of the changing world around her. Fans of Jandy Nelson and Stephanie Perkins will enjoy Webber’s debut novel. VERDICT A uniquely original novel about family, love, and the courage to stand up to life’s challenges and triumph which will delight teen readers. Recommended as a general purchase for all libraries. I’m thrilled to have my friend and colleague, Cameron, who blogs at Cam Loves Books, here for a guest review post. Cam reviews YA books and her reviews are witty & fabulous! Children’s and young adult book blogger. Library professional. Dog mom. English major. Intersectional feminist. Livin’ life one book at a time. History is All You Left Me, Adam Silvera’s sophomore novel, cements him firmly in the ranks of my auto-buy, auto-love, absolute rock star, favorite young adult authors. His main characters, Griffin, Theo, and Jackson, all leap off the page as fully-formed, deeply grieving boys, mapping uncharted territories of love and friendship in ways I’ve yet to see explored in YA fiction. The book’s plot is new and intriguing, and its gorgeous execution left me speechless. I know it’s early, but I’m calling it now: this will be one of my favorite reads of 2017. When Griffin’s ex-boyfriend, Theo, drowns while swimming in the ocean, Griffin is devastated. Griffin, who has OCD, thought that he and Theo were a perfect match, and that Theo might be the only person in the world who could understand and love him. He had always believed he and Theo would get back together, and imagining a future without him is something Griffin never thought he would have to do. His grief, guilt, and loneliness are threatening to consume him when Jackson, Theo’s boyfriend at the time of his death and the only other person who could understand what it’s like to lose him, offers to talk to him about their shared loss. As the surviving boys become closer and help each other heal, each must reveal secrets that could destroy their friendship, and potentially their memories of Theo, forever. With lovely writing and frank, complex examinations of grief and friendship, History is All You Left Me is a masterpiece from one of YA’s bravest new voices. Adam Silvera is an evil genius, and perhaps the greatest praise I can give his book is that I started crying in chapter three. It took me no time at all to understand the relationship dynamics between the characters and to care enough for each of them that it brought me to tears. And in a book that starts out with a bang – the death of a major character – it would have been easy for the action to fizzle, but Silvera managed to maintain a slight air of mystery throughout the entire story that leads to an even more shocking second act. I blame Adam Silvera for the worst book hangover of my life, because after reading his debut, More Happy Than Not, it took me five full weeks to be able to finish another book. So I knew I had to mentally prepare myself to read History. I knew it would make me cry, and I knew I would be faced with brutal realities packaged in gorgeous writing, which is an emotional one-two punch in itself. I definitely think you should come prepared to be knocked down, too: I think you should bring tissues, a fuzzy blanket, and your best waterproof mascara. However, I also think you should come prepared to be built back up, to think hard about friendship and healing, to learn something important about mental health, and to come out the other side a little more hopeful than you started out. Thanks again to Cam for this beautiful review. You can check out more of her reviews here. All of Jon Klassen’s picture books are fabulous read-alouds which will have children and adults begging to read them over and over. There is a central theme of a hat in each of his picture books so far: I Want My Hat Back, This is Not my Hat, and the latest, We Found a Hat. In We Found a Hat, readers will be delighted by two adorable turtles who seem to do everything together. Who doesn’t love turtles?! The only problem is that they have found a hat, together, of course, but there is only one hat, and two turtles. What are they going to do? And they admit the hat looks very good on both of them. Just the sight of a turtle wearing a hat causes a lot of laughter, as they can’t see a fool thing while wearing the hat. The story is divided up into 3 short parts, with some repetitive phrases, but ultimately building up to a delightfully surprising end. Klassen’s simple, but textured illustrations allow the reader to get so much out of the story. Watching the turtles’ eyes focusing on different parts of the pages will give the reader clues as to what is going on in the story and foreshadow a possible outcome. However, the surprise ending will leave readers laughing with joy. Maybe there really is a way for the turtles to be together and both have a hat?! You’ll have to read it and find out for yourselves. I would highly recommend all of Jon Klassen’s books for students in grades K through 6. The tales are really fitting and enjoyable to any age. 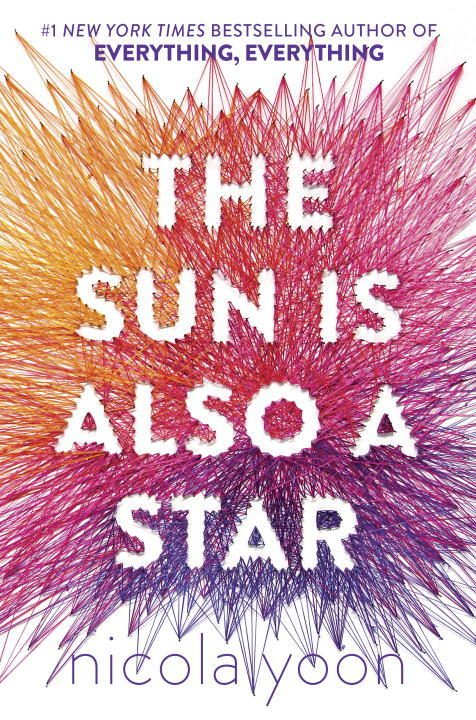 The Sun is Also a Star is set for release on November 1, 2016. Having absolutely adored Yoon’s first novel, Everything, Everything, I have been very eager to read her newest work. The story provides a behind-the-scenes peek at how an undocumented immigrant has to live with the daily uncertainty of being sent away from her home – the place she considers home in her heart. In the span of one single day, Daniel and Natasha’s story unfolds. They get to know one another bit-by-bit each time they cross paths. Fate, as far as they can tell, keeps bringing them together again. The characters are quite different in their outlook on the future, but still are immediately attracted to each other, creating an innocent, sweet romance with amazing possibilities. Both have futures planned out for them, which are not their choice. Daniel feels enormous pressure to become a doctor like his brother, in order to have a better life than his father had. Because of the mistake of her father, Natasha is being forced back to Jamaica where she doesn’t have any real connections or interests. When they meet and share their stories, the urge to try to save themselves becomes even more urgent – before it’s too late and they lose each other forever. They day they spend together allows them freedom from the extreme pressure & stress they are facing. Together, they are able to be themselves, with no one to impress and only each other to please. The ending of the story is hopeful, allowing the reader to imagine a future for both Natasha and Daniel, rather than detailing what is going to happen to them and tying everything up with a little bow. A really neat thing about this story is that the author, Nicola Yoon, is Jamaican American like Natasha and her husband is Korean American like Daniel. She wrote what she knew from her own personal life, and it’s evident by the true-to-life feel of the story. Great job, Nicola. This is a beautifully written, moving story which will stay with readers long after the last pages are read. Thank you to Random House for sending an early review copy of this book. Holding Up the Universe will be published on October 4, 2016. If you thought Violet & Finch from Niven’s All The Bright Places were unforgettable characters, wait until you meet Jack & Libby. Much like with All the Bright Places, Holding Up the Universe is written with chapters alternating back and forth between the two main characters, Jack and Libby. The story moves along quickly in this manner, and I found myself unable to stop reading, finishing the entire book in an evening. Libby is a strong female character, but also a major target for bullying because of her weight. Once the world’s fattest teen, she had to be cut out of her house and rescued. Due to grief & depression from the sudden, unexpected death of her mother, Libby became so large that she was physically unable to move from her bed. Now after therapy and rehabilitation, Libby is half the size she used to be, starting her junior year of high school with a new confidence and determination to make it through and enjoy the experiences. She knows there will be bullies and name calling, just as there always was when she was younger, but its how she responds to them now that shows readers (and Jack) just how much she has truly grown. Jack is everyone’s favorite classmate, favorite teammate, favorite friend, etc. He’s a likable guy who appears to have everything going well for him. However, he is carrying around a burdensome secret that is threatening to upset the somewhat normal aspects of his life. He has a rare genetic disorder called prosopagnosia, in which he is face-blind, or unable to recognize facial features, even of those people he sees everyday (his family and best friends). To make matters worse, his father is cheating on his mom with one of his teachers, causing Jack to be awkwardly, and unwillingly involved. Jack is coming to a crossroads where he has to decide whether to tell anyone his secret, or to watch his comfortable lifestyle and friendships crumble around him. When Jack and Libby’s path collide in a peer-pressure induced bullying incident, they end up in a group doing community service together. As they spend more time together and start to lean on each other for support, knowing that they both are fighting a battle and that life is tough, they become stronger together. Readers will absolutely love this pair of characters – Jack for his charm & quick wit, and Libby for her no-nonsense attitude and healthy dose of sass. I certainly did. It’s clear that Niven thoroughly researched prosopagnosia, helping the story to seem very real. Niven’s writing style is versatile. Readers will be laughing hysterically on one page and crying for the characters on the next. She also has a knack for transporting her readers into the halls of high school, causing them to reflect on their own experiences as they go through some of the same situations with her uniquely crafted characters. This is a beautiful story about embracing oneself, flaws and imperfections included, and realizing that everything is far from perfect, but perfectly okay. Thank you to Random House for the early review copy. I was excited to see Lara Avery had a new novel coming out, because I read A Million Miles Away and loved it. Now The Memory Book has become my favorite Lara Avery novel. I devoured it in just over one day. The chapters are short, mostly written as journal entries into Sammie’s memory book, making for quick, easy reading. Avery’s characters seem so real that readers will have no trouble loving them, despite their flaws. This is the story of Sammie McCoy, a high school senior and valedictorian of her class, who is preparing for the national Debate finals and starting college at her dream school. She has worked tirelessly for the past 4 years, planning out everything so her future would be bright. Sammie’s family plays a big part in her life, and she enjoys time spent with her parents and three siblings. However, Sammie is writing everything down hoping to never forget. She is hoping Future Sam will be able to read and remember all the things she likes, dislikes, and all the things she has experienced. True to her personality of being a go-getter, perfectionist, planner, and fighter, Sammie plans to keep living as best as she can, even after she is diagnosed with a rare genetic disease (Niemann-Pick Type C) which will cause her to lose her memories and eventually die. She doesn’t tell anyone about the disease at first, keeping it from her best friend and even her boyfriend. Sammie doesn’t want to be pitied, because she is determined to beat the odds and go ahead to college and chase her dreams. Sammie is inspiring and brave. She is determined to spend her remaining time on earth really living, and being with the ones she loves. Even as her health declines, she still records all of the everyday moments in her memory book. She wants it to be real, showing both the ups and downs of her life. One of the most memorable parts of the story was the scene where Sammie and Coop are together and Coop is reviving Captain Stickman, a character who made his appearance often when they were children. The way the scene is written with the back-and-forth shouting is hilarious, but also touching because it shows how Sammie can and has always been able to truly be herself with Coop, even if they have grown into young adults with pressure and responsibility. I was laughing out loud during this scene because it was a perfect way to capture Sammie and Coop’s easy-going relationship. I also cried a lot while reading Sammie’s memory book, especially near the end when all of the people she loves are writing in the book. Fans of All the Bright Places and The Fault in our Stars will love this story, as it touches on some similar themes. However, I found it to be unique and an absolutely beautiful, touching story. I’ll be recommending The Memory Book wholeheartedly to all of my students when school starts up again in August. Thanks to Little, Brown, and Company for the Advance Review Copy.